Mission Sunday celebrated in Lent is an opportunity to look at the achievements of the Missions Office, which operates in PME under the leadership of Father Czesław Tomaszewski. It began in the autumn of 2008. The beginnings were not easy. On the list of missions’ benefactors there were 90 names, in the cash register there was a little more than 20 thousand zlotys. Fr Czesław started to work creatively for the mission. He began to publish a missionary bulletin, which is published twice a year in several thousand copies. He publishes an annual missionary calendar with up to 15 thousand copies. They are distributed free of charge for a 'voluntary donation'. It runs four mission pages on the Internet. He has been involved in many Missionary Actions in parishes, not only in Jesuit ones. He led missionary catechesis, published 2 books related to missions, a medal on the occasion of the 100th anniversary of the death of Blessed John Beyzym, organized missionary competitions about our holy missionary for school-age children. In addition, he conducts daily correspondence often related to the proposed missionary actions. What is the effect of these struggles? Today there are on the list 1750 active donors. In past years we managed to raise almost 6 mln zlotys for different mission projects. The amount raised increased from year to year. In 2018 we managed to raise almost a million zlotys transferred to Zambia-Malawi, Madagascar, Ukraine and many other countries. On January 28-31, the brothers of the Society of Jesus, belonging to the PMA Province met in Kalisz. The meeting was of a formative and recreational character. Considering before God the spiritual path of Ignatius Loyola, they shared the joy of vocation. Despite the sadness caused by the departure to the Lord of the two oldest brothers who died in January, eleven Jesuits of different ages looked to the future with hope, praying for new vocations. Father Ryszard Friedrich SJ, an experienced spiritual guide, helped to confront the spirituality of the founder of the Order with the spiritual experience of the brothers working in Warsaw, Kalisz, Gdynia and Gdańsk. Have I experienced such a time in my life that I could compare it with the experience of St. Ignatius in the cave in Manresa? This is one of the key questions answered by the participants of the meeting in Kalisz. Once this question made them choose the Jesuit Order. Today, they confirmed and thanked God that they could serve Him just as the converted knight Ignatius and his companions used to serve Him. The Almighty has done great things to me! Charismatic Forum in Łódź. "The Almighty has done great things to me! - was the slogan of the Charismatic Forum, which took place on 9-10 February in the Łódź Sports Hall. The organizer of the forum was the Jesuit pastoral ministry "Strong in spirit". The guest of the formation and evangelization meeting was Mary Healy, a world-famous biblicalist, an international speaker and a doctor of Catholic theology. For many years she has been associated with the Catholic Charismatic Renewal as Chairman of the Doctrinal Commission within the International Catholic Charismatic Renewal Service The participants of the Forum listened to four conferences entitled: "Wait for the promise of the Father", "The Charism of the Holy Spirit", "My transformation is possible" and "Jesus heals today". They also took part in an evening of praise and adoration of the Blessed Sacrament combined with a prayer for healing. 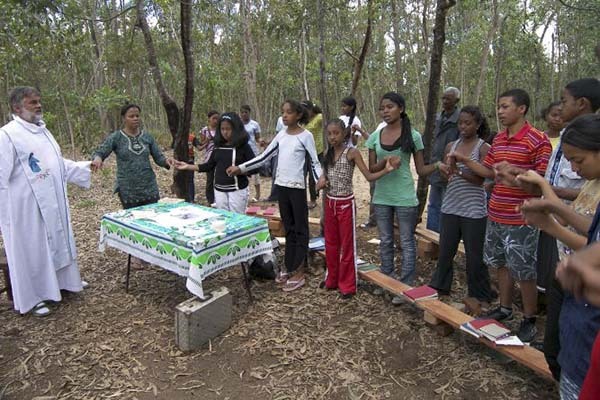 On the first and the second day, the people gathered in the Sports Hall participated in the Holy Mass. On the first evening Mass was presided by Archbishop Grzegorz Rys. 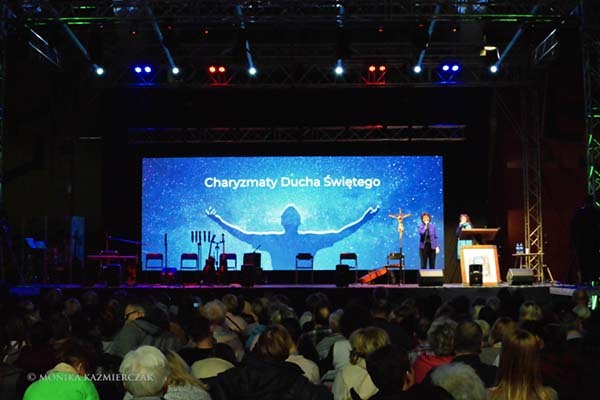 The Forum was attended by over one and a half thousand members of charismatic groups who came to Lodz from all over Poland and even from abroad. - Remigiusz Recław SJ is the responsible for the "Strong in Spirit" community at the Jesuit parish in Łódź. This type of formation and evangelization meetings are being held in Łódź twice a year for several years now: in autumn and in spring. 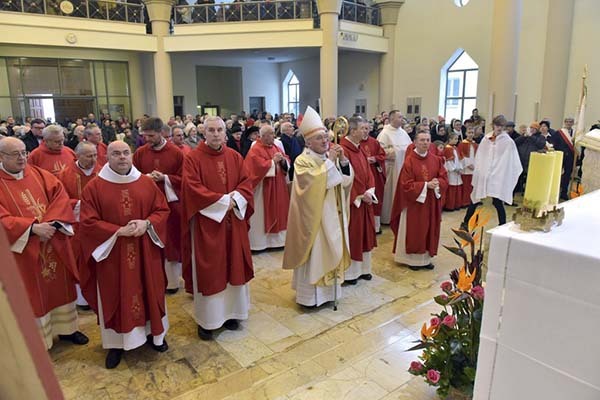 On January 27, 2019, the Jesuit parish in Warsaw celebrated its 70th anniversary. The solemn Holy Mass was celebrated by Cardinal Kazimierz Nycz. After the Holy Mass a common agape took place. For the first 50 years the faithful met in the Liturgy in the chapel and in 2000 they moved to a church built in the former Lubomirski Garden. Apart from Jesuits, there are also Felician Sisters and lay people working at the parish. In addition to strengthening the homily, the sense of unity at the Eucharistic Table and creating a sublime atmosphere of music, the icon of St. Stephen was donated by the artists gathered around the Jesuit initiative "The Way of the Icon". 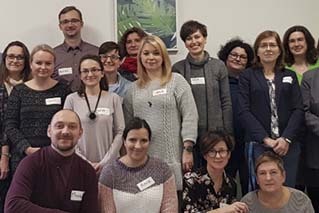 The first meeting of psychological and spiritual support centres, based in our Jesuit Centres all over Poland, took place in Warsaw last December. About 20 representatives from the 7 existing and 2 soon-to-be clinics met at the headquarters of the Inigo Foundation for Psychological and Spiritual Assistance. The day spent together was an opportunity to get to know each other, listen to and exchange experiences. All those invited, were enthusiastic to attend and were pleasantly surprised when they saw they were in such big number. While in Gliwice, Kraków, Łódź, Lublin, Poznań, Toruń and Warsaw there are psychological and spiritual assistance centres that have been open for many years, others in Gdynia and Częstochowa are about to open their doors. These places were borne out of the desires of Jesuits and lay people. This meeting - also the fruit of desires - was another step forward. Everyone went their separate way with the desire of Magis and aware of the mission that unites us, in spite of the different places and realities we work in. Pray-as-you-go is developing rapidly in Poland. Last year, the number of listeners increased significantly and we introduced many new functionalities to our application. Recently, we have asked almost two thousands of our users to complete a Prayer on the Move survey. Its results are good reason for optimism. Statistics show that in the past year the average listenership to our reflections has increased. There wasa daily increase of 1700 users, more than the previous year. In October more than 122,000 people connected every week to Pray-as-you-go. 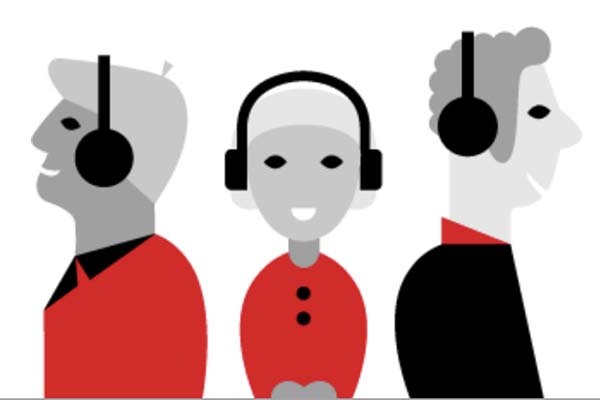 A year ago, the average weekly listenership did not exceed 90,000 listeners. One of the reasons for this positive change is certainly the increasing number of collaborators. Last year, 82 people cooperated with us, in 2018, this number increased to 95. It is worth mentioning that two years ago it was "only" 50 people. our co-workers mainly include people writing reflections (78 people), teachers (9), remote IT employees (2), two volunteers, three proof-readers and one studio employee. Among the reasons for the increase in the number of users are our additional functionalities, which we regularly add to the application. They attract new listeners. These include: Ignatian Examination of conscience. Fr. Remigiusz Recław’s sung Rosary, the Ignatian Way of Mindfulness of Father Paweł Kosiński SJ or Retreats with Father Pio. The so-called #WiaraLive's meetings with our listeners live on Facebook are also an effective tool of promotion. Recently, our programs have gained a new, very professional image. we no longer transmit them via phone. Instead we have prepared a special studio, and the Inigo Studio team helps us in the technical implementation.